My mother-in-law is visiting for the next 10 days, so I'm not sure how much time I'll have to spend writing here. It's certainly going to be an interesting visit, since I can't really talk to her (she speaks only Russian, me only English). However, I just might have time to finish my gift crafting, since all she wants to do is play with Lev (can't blame her, he's at a very fun stage). I'm going to try really hard to get some photos to share, since we haven't been doing that enough the last few months. 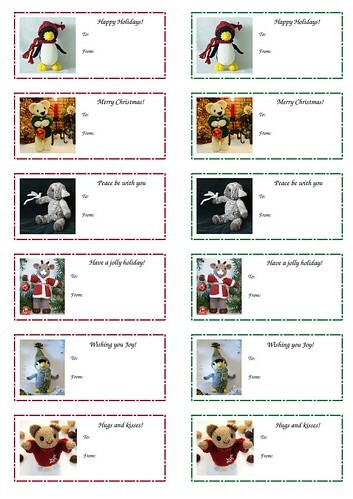 I thought I would share again these little gift tags I made last year, since the timing seems about right. Just click here, to get the largest size to download. Then print them on heavy paper, cut out (with fancy scissors if you have them), and punch a little hole. Piece of cake! P.S. If you're not in North America, and your printer takes a different paper size, your printer should adjust the image margins to fit (you might have to check your printer settings to make sure it does this). Posted by Barbara Prime at 11:02 a.m.